Plain and simple, you need both -but, that wouldn’t make for much of an opinion if I left things that way. In fact I think it does go deeper than a simple answer. In my opinion, it is best to start teaching using the sight words. Especially if you have a struggling reader. Most of the trouble that I see and hear from parents is that their child struggles sounding out words/using phonics. Of course every situation is unique, and I am always happy to answer questions BUT, here is my reasoning. Seventy to seventy five percent of what a child reads are sight words. These words cannot be sounded out, they must be memorized. For example, take the sight word “good”, or “one”. If a child saw these words they would become very frustrated when trying to sound out these words. These words are not phonetic: they cannot be sounded out. Seventy five percent of what a child reads are sight words. If a child does not memorize and know these sight words fluently, they will fail at reading seventy five percent of the time! A child who fails at reading these words, or fails at phonetically reading words, becomes frustrated with reading and begins to dislike reading. If you failed at doing something 80% of the time, you would not want to do it any more. For this reason, many students just give up when learning to read. At Sight and Sound Reading we want to emphasize the importance of making sure your beginning reader has confidence. A confident reader loves to read! If you have a struggling reader, we suggest giving our Free learn to read program. In this program the students learn sight words, to help them learn to read. The students learn these words in context so that they can see that reading has meaning. This helps build their comprehension skills, and gets them excited about learning. Each day the students learn new words and before they know it, they are reading an entire page of words that they know! We always like to focus on what the student knows, instead of getting the students frustrated by what they do not know. We weave phonics into the lesson and then intensively introduce phonics around day 15. Before you know it, students are reading both phonetically and sight words easily. There is no question, you need to learn phonics in order to learn to read, BUT, I truly believe it is so important to first learn sight words (in context) and gain confidence before jumping into phonics. Some students do wonderful learning phonics first. Those same students do wonderful learning sight words too. For children that struggle, try our free learn to read program Start the program at a place where your child knows all the words. You want your child to be confident in what they are reading. This may mean starting the program from the beginning. When learning to read, confidence is key to reading success! If you would like to start our free reading program, enter your information into the form below. I will send you all the directions and walk you through the steps each day. 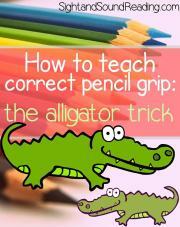 Want to know a fun tip to help teach your child how to hold a pencil? 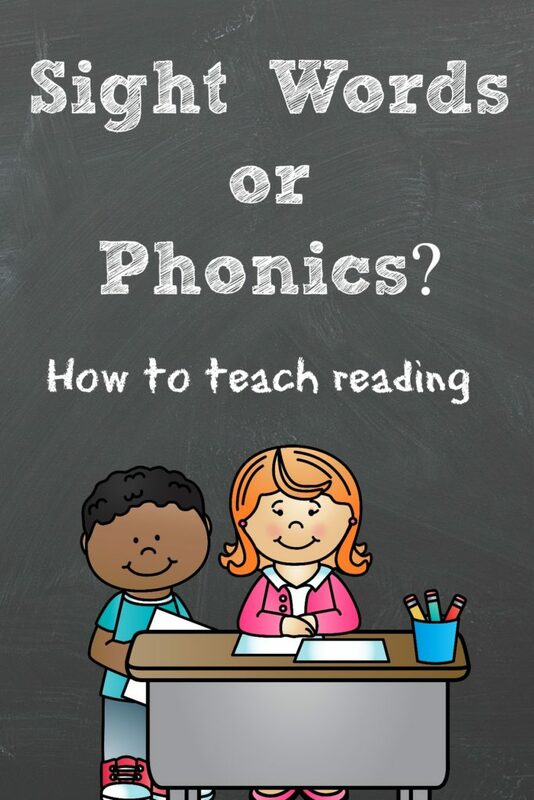 My two are only 21 months but i’ve already started thinking about teaching them to read – and I was confused by phonics and sight words so this has helped clear things up for me. I like the idea of using both methods. So true! Read, read, read to your children early and often. It all comes together when the children are ready. When children are ready to read, it usually comes very naturally. It is amazing how everything comes together in a perfect world. But, you are absolutely right…it all starts with children hearing you read and speak. You are incorrect. The majority of our words prove phonetically — actually, around 84 percent. And that percentage is mostly if the words are spelled on sound-symbol correspondences alone. One letter may be off, but the word is mostly predictable. Researchers estimate that only four percent of English words are truly irregular. Teaching through explicit phonics instruction can help students learn patterns and can give them a framework for spelling that will increase their chances for spelling accuracy. You would greatly harm a struggling reader with this approach. 20 percent of our population is dyslexic which means they cannot retain sight words as well as others. They have poorer visual memory and being taught to read phonetically with rules like in Orton Gillingham they are then able to decode and make sense of our language. It frightens me to read something so untrue and not based on scientific peer reviewed information. You can visit the Yale Center for Creativity & Dyslexia for more information on reading. If you notice what the fact stated, it said 75% of what CHILDREN read does not work phonetically. This is because most emergent and early readers are designed to start with patterned text that is meaningful to the new reader. Extremely contrived “decodable” readers I find are very difficult to comprehend for little ones because the language does not match the children’s literature that they have been exposed to earlier. One example of the text I am talking about is a book that states “Nan can. Can Nan? Yes, Nan can!” Who talks like this? Surely not little ones! However those emergent readers that start with text such as “I can see the monkey. I can see the zebra. I can see the giraffe.” In addition to a photograph or illustration of said animal, children are learning sight words and phonetically regular words, but most of all, that reading has MEANING. Absolutely reading has meaning…and that is what we teach as well. If you look at our FREE program, we are teaching words and text that have meaning…we have children read and color what is read. You can see the child understands what is read because we ask them to read and do what is said. Children love to read because reading has meaning -and their whole world opens up because they feel proud that they read and understand. I give many free resources here for parents/teachers to use to help teach reading. THey can even contact me and ask how to help specific readers. What is important is that you look at each individual little reader and adapt accordingly so that the child learns to read. I disagree, as well. Just think of your closest friends last names. They are not sight words. How did you figure out how to read their last name? You sounded it out. As we get older we sound out words so fast, it feels like it is sight words. In reality most words can be sounded out phonetically. You should teach kids to sound out words first!! If you teach sight words first, you are teaching kids to guess in stead of read. Then phonics is even harder, because kids want to guess when they see the first letter of a word. We can agree to disagree. In my classroom I find it very successful to teach sight words first, and then phonics… I start with sight words for like 10-15 days to help the students gain confidence and then I introduce phonics. I give the resources here so that parents/teachers can teach FOR FREE in whatever way they choose. I suggest sight words first, but you can do as you feel is best. What is important is that you look at each individual little reader and adapt accordingly so that the child learns to read. I am totally for phonics (as is this free, but high quality program), but you MUST learn sight words as well. What is it, like the top 500 words in every language are 80% of what you say?